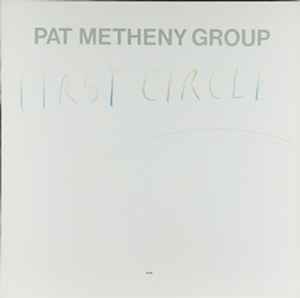 In First Circle, the Pat Metheny Group settled into a lineup that lasted for quite a while -- with Metheny, keyboardist Lyle Mays, bassist Steve Rodby, and new drummer Paul Wertico forming the core quartet. The ever-restless Metheny also mixes up the music, not quite leaving the Brazilian glide behind but coming up with some fascinating permutations always affixed with his personal stamp. "Forward March," the album opener, is a bizarre parody full of detuned instruments and half-cocked trumpet from Mays; one wonders if this was directed at a few silly skirmishes of the day (Grenada? the Falklands?). "The First Circle" has Brazilian elements, but now in the service of a grander architectural context, while nothing could be simpler and yet more sophisticated than the delicate ballad "If I Could." "End of the Game" might be the best track on the record, equipped with a beautiful pop-flavored set of tunes and harmonies, with a rock beat fused to the floating ambience of South America as personified by the new Argentine percussionist/vocalist Pedro Aznar. "Praise," the closer, is an out-and-out rock tune, an affirmative flip side of "Forward March" and the last of a series of delightful surprises.